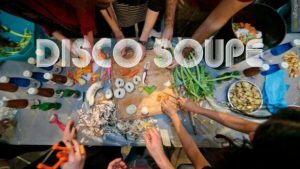 Have you heard of Disco Soup? You may, as this event is spreading out throughout Europe as a celebration of taking food waste out of the bins and filling lots of bellies instead. What is used to be known as skip diving, urban gleaning, salvaging, or just recycling perfectly edible food that happened to be in the bins, is now an organized effort that brings together hundreds of volunteers to collect food waste, cook it collectively and eat it to the sound of funky music, positive vibes and a conscious awareness that food waste has no place on a finite planet. In Manchester, Disco Soup was a ground-breaking event organized by the Real Junk Food Project Manchester, that brought together more than a hundred volunteers last Saturday June 20th for a day of healthy, nutritious meals for anyone and everyone, on a pay-as-you-feel donation basis. Only for this event, they saved about 700 Kg of food that would otherwise gone to waste from supermarkets, restaurants and a number of other sources that collaborated with the event. The popularity of food waste related type of events has only been increasing in the last years, as more and more people is taking action to respond and end the wastage of perfectly edible food. 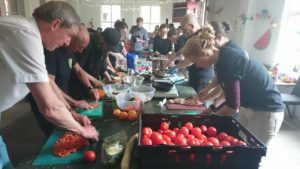 Campaigns and events such as Disco Soup, FairShare Greater Manchester, the Feedback campaign, which includes the Gleaning Network amongst others, are definitely playing a key role not only in increasing awareness, but in actually reducing food waste as a matter of fact. Moreover, the contribution of food waste to climate change is outstanding, manly from two sources: the GHG emissions related to the production of food and the GHG emissions related to their waste disposal. To have an idea of how many tons of GHG emissions are related to food production that is never eaten, Tristram Stuart offers an eye-opening figure in Waste: Uncovering the Global Food Scandal (2009): assuming that wastage levels by consumers is of around a quarter of all food is representative – as found by WRAP’s study in the UK and by the Department of Agriculture in the US – it can be said 10 per cent of all greenhouse gas emissions in these countries come from producing, transporting, storing and preparing food that is never eaten. Moreover, the resources devoted to produce food are very significant: every year, according to the FAO, the production of food uses up to 1.4 billion hectares of land – 28 per cent of the world’s agricultural area. Similarly, the blue water footprint for the agricultural production of total food waste in 2007 was of about 250km3, which is more than 38 times the blue water footprint of USA households. At the end of its life cycle, food waste can be a major source of GHG emissions, most notoriously methane,which has a heat-trapping power 25 times higher than CO2 over a 100-year period. When food waste is landfilled as part of mixed waste, not only it produces GHG, it also can contaminate the soils and water sources with leachates. If not used for feeding purposes, the alternatives to food waste disposal have been widely explored in Zero Waste Europe’s training on organic waste and various materials, making strong recommendations for composting and anaerobic digestion. The good news is that awareness is increasing and food waste is decreasing as a matter of fact at least in the UK: since 2007 there has been a 21% reduction according to WRAP. Still British households waste around 22 per cent of all the food they buy. Hopefully the downward trend will continue speedily.